Non-equilibrium statistical mechanics is a subject that deals with many systems in nature that are stochastic and often out-of-equilibrium. Common examples of such systems are biomolecules such as motor proteins, bacteria exhibiting chemotaxis, fluctuations in the stock market, several driven condensed matter systems etc. They differ from several other systems around us because of their noisy environment. Moreover, many times tools of equilibrium statistical physics are just not enough to describe their peculiarities. Deepak’s interests are in using the tools of non-equilibrium statistical mechanics to understand some of these simple and complex physical systems. 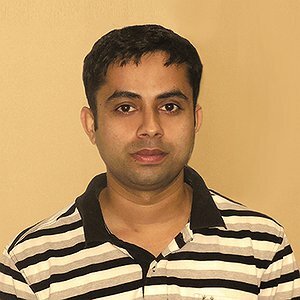 Deepak has worked on understanding some of the statistical properties of a biophysical process responsible for the spatial organization of biomolecular structures inside a cell, namely the molecular motor based intra-cellular transport. How does interaction between the molecular motors influence the overall statistics of transport is the main subject of the study. In the recent years, he has been exploring the connection between information theory and thermodynamics. Szilard engine, the simplest version of Maxwell’s demon has become his system of interest in this direction. Based on a microscopic model, understanding the dynamics of piston pushed by single particle gas that constitute basic unit of Szilard engine, and using that to interpret the Szilard’s classic result is the main focus of this study. Understanding stochastic thermodynamics of small systems, problem-based on random walk model, first passage time problems, bacterial chemotaxis, active matter system, understanding cytoskeletal filament dynamics etc. are other areas of his research interest. Deepak will be joining SFI later this year. He is currently a post-doctoral fellow at International Centre for Theoretical Sciences, Bangalore. He received his Ph.D. from Indian Institute of Technology Madras, Chennai and Masters of Science from Indian Institute of Technology Guwahati.